I realize that I don’t always have the most interesting and creative food. I wish that I had time to make extravagant meals three times a day, but I don’t. It’s just not practical, nor do I really think it’s necessary. My life is really busy! My goal with this blog is not to land some fancy extravagant chef job, but to show people that it IS possible to live healthfully even with a million other things going on. I know that I have my days that are more stressful and less healthy than other days. However, taking care of myself, eating well, and living a full happy life (and showing others they can do the same) is very important to me! I hope that this message is portrayed, because that is my true passion. I actually took a break for lunch today! 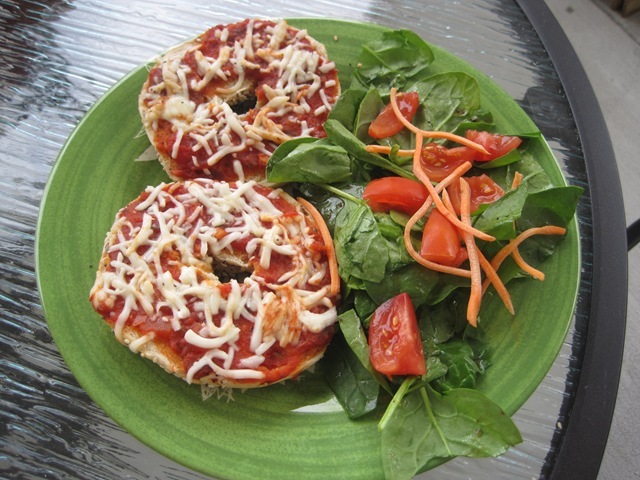 I couldn’t really figure out what I wanted, but ended up deciding on a pizza bagel! 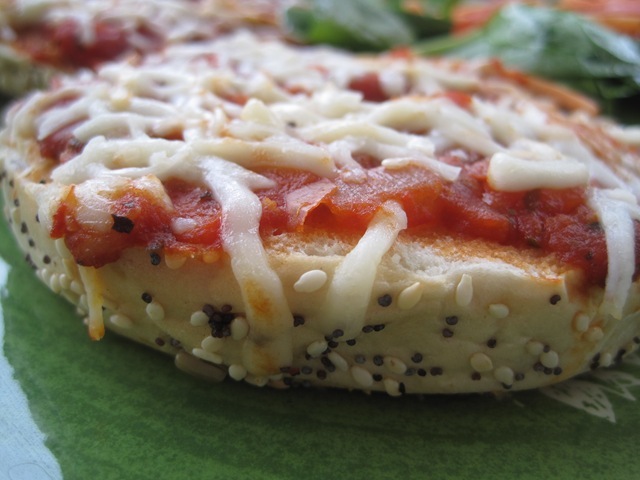 I used an everything bagel as the crust, topped with marinara sauce, and mozzerella cheese. I toasted it in the oven at 375 degrees F for 7 minutes. Along with it, I had a spinach salad with tomato and carrot. Gotta get those veggies in! Jason saw me studying for the FE hard-core when he came home. He offered to make me dinner before I left for class. I NEVER turn an offer like that down. 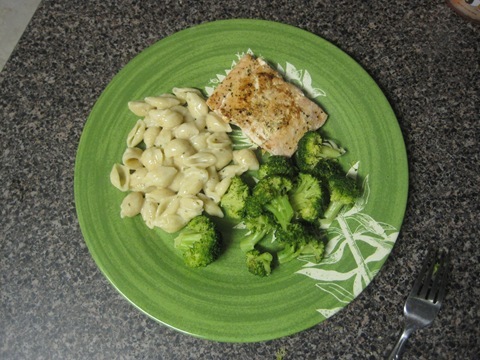 He made salmon with lemon pepper seasoning, steamed broccoli, and some sort of white mac n’ cheese. It was standard, but I’m not going to complain! It’s so helpful to have Jason cook every now and then. He’s no expert, but learning for sure! Thank you! I realize I mention the FE exam every single post. It’s seriously the only thing on my mind. After Saturday, I promise I will shut up about it. Today, I was taken aback by the kindness of a fellow blogger, Julie. She is also an engineering student about to graduate in May. Even though we have never met, I know that we would be instant friends! Julie was SO thoughtful and sent me a gift certificate to MixMyGranola with encouraging words about this weekend’s test. It seriously made my entire week. 😀 Thank you!! 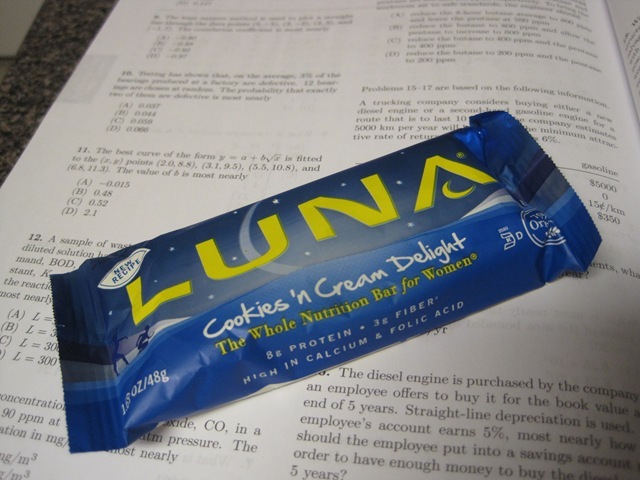 Sometimes I feel so alone being a “nerd” engineer. The past week or so it seems like more and more engineers out there have been giving me encouraging words on the blog. I love it!! I am so thankful for the blogging community! Thank you again, Julie! Don’t forget you have until Sunday night to submit your Blogger Secret ingredient recipe! Each recipe will be featured in Monday’s post, and the winner will receive a token prize! Get your creative thinking caps on, and make some ACORN SQUASH! Submit you recipe to MegaNerdRuns@gmail.com ! The FE exam is in 34 hours… I’m getting nervous!